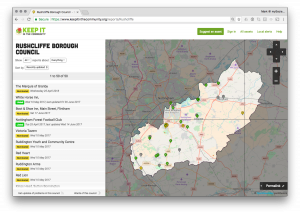 Over the past few months we’ve been periodically updating you on the progress of our website for mapping Assets of Community across England. Now, we’ve officially launched. Keep it in the Community, or KIITC for short (pronounced ‘kitsy’), currently shows a snapshot of over 5,000 England-wide registered ACVs. We hope that researchers of all sorts will use it as a resource. And while the Act also requires local authorities to maintain and publish a register of such Assets, one thing has been missing: the ability to see a picture of how these rights are being used across the country as a whole. Do some regions contain substantially more ACVs than the norm? Are more applications rejected in some places than others? And just how many Assets of Community Value have been identified to date? We believe this sort of inquiry is essential if we’re to understand the efficacy of the Act and whether it’s achieving what it was designed to do, and now KIITC makes that possible. As you may recall from our previous posts, our original ambition was not only to gather together and publish all the existing data from the ACV records of England’s many councils, but also to invite community groups to submit new applications to their local authorities, directly through the website. From long experience in similar projects, however, we knew that there would be challenges, and indeed this turned out to be the case. While all councils are legally required to display this data, they’re not given any guidance as to the format in which it should be displayed, and the huge variety of different formats, together with the frequency with which the location of the files in which they are published change, make an automated approach almost impossible, especially within a resource- and time-constrained project. These factors make it hard to sustain what is really the only practicable approach for a project with limited funding — the automated ‘scraping’ of websites. Scraping sends a small script out onto the web to regularly check whether new data has been added to a location; in this case, each council’s ACV register. A piece of code can retrieve the data and put it into the right format to be republished on your own site: it’s how we published Parliamentary debates each day on TheyWorkForYou.com for many years, for example. But this is really only a practical option when everyone is publishing in one of a few standardised formats. What would be a solution? Well, in an ideal world every authority would be putting their records out as lovely, consistent data. But we understand that this is rather an unrealistic expectation. Faced with these difficulties, we met with Power to Change, who originally funded the work. We were in agreement that, sad though it was to set aside the other features of the project, there was still great value in collecting a snapshot of all ACV data across England. So, ambitions of scrapers accordingly readjusted, we manually entered all the relevant councils’ registered ACVs and uploaded them to the site. Please note that some data may not be 100% accurate; it all depends on what we were able to collect at the time. The most comical result of this is that assets where we don’t have a precise postcode for location may appear to be floating in the middle of the ocean… but these are the minority. And it’s worth remembering that the dataset as a whole is the best available right now. Of course, the data will quickly become out of date, but we believe that this unprecedented collection will have many uses, nonetheless. For the moment, we won’t be updating the site with future data, unless further funding becomes available for us to do so. We’ve also put plans for community group submissions on the back burner for now, aware that if we are to provide this service, we need to better what is already out there on the councils’ own websites. When time allows, we’d like to explore ways to encourage citizens to help keep the site up to date, allowing them to update data that has already been imported, and consider how they might suggest new ACVs to their relevant council via the website. As part of that vision we’ll need to reach out to councils to demonstrate how we have visualised the data, and work with them to participate. Open data projects such as these rely on identifying useful and practical ways for public sector organisations to more easily release data in a common and consistent format so that others can make best use of the information — a task that has much wider implications for all sorts of niche datasets such as this. If you’d like to find out more please get in touch with us at hello@keepitinthecommunity.org: we’d be keen to hear from you if you’d like to help us trial managing your own data on the service. Thanks again to Plunkett Foundation, Power To Change and MHCLG for their support in making this happen. A couple of years ago we started discussing a collaboration with the Plunkett Foundation to create a searchable and maintainable public register of Assets of Community Value in England. After a few delays I’m glad to say that this project, thanks to the generous support of Power To Change, is now taking place and we’re already well under way with initial prototyping and development work. Now, what’s an Asset of Community Value I hear you ask? According to Locality, who are pretty good source of information on these sort of things, Assets of Community Value (ACVs) are places and spaces in your community that are important to local people and if they come up for sale, the community has the opportunity to bid for them. ACVs can be anything from your local pub, to a sports pitch or community hall, churches or even the local cinema. Whatever is of most importance to you and your community; and especially what you might want to protect should it change hands or come up for sale. The Localism Act 2011 requires district and unitary councils to publish a list of nominated, approved and rejected community assets, which can be viewed by the public. The vast majority of councils publish this information online, but formats and levels of information vary widely, from very basic information to more comprehensive details and support. As a result knowledge and awareness of the community right to bid is very low and take up is equally patchy, so with this project we’d like to help change that. Building off the back of our FixMyStreet Platform we’re creating a single register that will gather together all of the currently listed ACVs — including those that were rejected or are currently going through the process of nomination. Just as FixMyStreet publishes its reports, these assets will be displayed on the map for anyone to view, share and discuss. With the help of the DCLG we’ll work with local councils and provide them with support to list and manage ACVs in their area, as well as embed their own listings on their website. The service will provide help and guidance for organisations that are eligible to nominate an asset for consideration and we’ll standardise this submission process. As the service develops, local community members will also be able to highlight assets they believe should be put forward for consideration, as well as add additional detail such as pictures and notes to registered ACVs on the site. At this stage we’re looking for more collaborators who are already active in this space to come forward and get involved. We’re already in touch with CAMRA, Sport England, the Woodland Trust, and the Land Registry, but if you would like to offer some help or support please do get in touch. We’re particularly keen to connect with Local Councils who are already actively making use of ACVs, so if you’re an officer responsible for managing the ACV process for your council we’d love to hear from you. We know from Locality that there were at least 5,000 registered ACVs this time last year, but that list was already a little out of date and there will be more to add. Keeping everything up to date from the usual mix of web pages, spreadsheets and PDFs is going to make things challenging as well. This is a particularly interesting extension of the FixMyStreet Platform and it’s a useful way for us to explore how to best extend the citizen engagement features of FixMyStreet beyond issue reporting and into celebrating what makes each local community unique and valuable.